Get your website speed optimization done correctly cause page speed matters!! 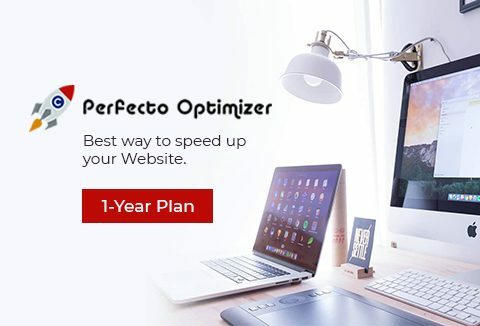 Perfecto Optimizer is the best and simplest solution to speed up your website. Increase your revenue, make more sales with improved page speed. Buy Now! Why Is Website Speed Optimization So Important? Website speed optimization is crucial as it lets you know how well your website is performing. Page Speed plays an important role for the same reason. It is all that matters for increased traffic and more sales. Why Choose Perfecto Optimizer For Website Speed Optimization? The Perfecto Optimizer is a simple solution for improving site performance by doing proper website speed optimization. Perfecto Optimizer tracks and analyzes your website’s load time & bottlenecks that affect your customers end-user-experience. It saves each test for you so you can review it later. Also, see how things change over time leading to effective website speed optimization. Together with the huge set of optimization tools of Perfecto optimizer, you can fast and easy compress your data. Perfecto Optimizer keeps all un-minify versions of your files. So later you can easily re-edit the elements of your site in a readable format. This deal includes 1 Year Access to the premium plan. Will get 1 license key to activate the account on the purchase of the product. It includes a Commercial license. Know a lot about your website's working in detail with website speed optimization. Get Your Website Speed Optimization Done Today! It helps to optimize the website. It would have been great to have a lifetime deal.